Welcome to Keats Vehicle Wholesale, a small family business owned and operated by Craig and Jeni Keats. Craig is a registered motor trader has had more than 25 years in the motor industry and has been importing vehicles from Japan for 18 years. All vehicles are hand selected and prepared to the highest standard. For your peace of mind they are VINZ certified, Odometer certified and AA Appraised. 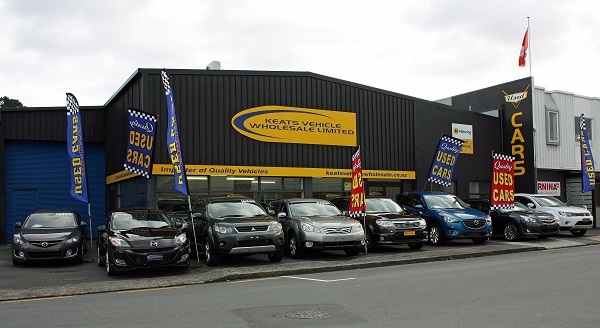 What you will find at Keats Vehicle Wholesale is quality vehicles prepared to a high standard undercover. Where you will be left to browse at your leisure with no pressure and Craig and Jeni on hand to answer any questions. Craig believes when purchasing a vehicle price is a large factor and by keeping overheads to a minimum the best possible price can be achieved. Internet sales now make up an increasingly large percentage of business and customers often prefer to research and make decisions on their next vehicle purchase using the internet. Craigs aim is to make this process as stress-free as possible, by providing high quality vehicles on-line, that can be delivered to your door. So if you are looking for a late model quality vehicle, you don't mind shopping in a warehouse environment with no gimmicks, frills or pressure and you would like more car for your money, phone Craig and Jeni or call in at 15 Aglionby St Lower Hutt.